I found this photo in an old packet of prints. At a guess it is around 15 years old as it's from a camping trip in my VW, and I've not been anywhere in that for over 10 years (still for sale!). Wessex Flour Mill is still a working mill - I could give you some history, but it's much better on their own website. It's an odd looking, and slightly posh building. Those arches over the top of the square windows are a decorative feature I've not seen before.. The whole lot looks a bit spruced up to satisfy the good citizens of Wantage to me, but then we are a long way from dark satanic mills, so perhaps it's always been pretty? I like that ugly pipe sticking out of the top though. Sadly over the last 35 years, I've watched a very similar mill not a million miles from there go from renewed prosperity to bankruptcy. The main causes were the lack of investment in new machinery that had the same flexibility as that installed in the sixties, and the disappearance of the type of baker who was their main customer. Aha, it is not often I see somewhere I recognise locally! (I live a brisk 20 minute walk away.) I've always known it as Clark's Mill, and appropriately it is located at the foot of Mill Street in Wantage and built over Letcombe Brook. 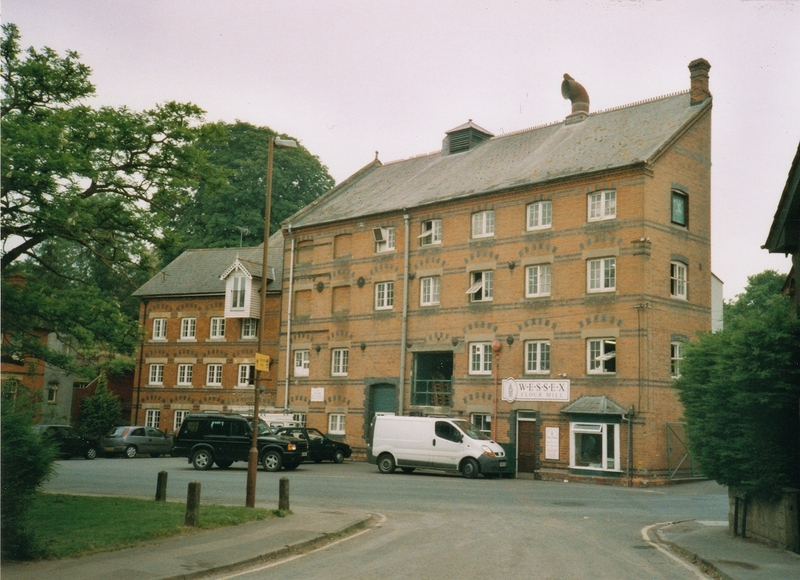 This mill, at the time “Clark’s Mill”, was in its original form (before rebuilding after the fire of 1945) a significant source of traffic for the Wantage Tramway in the form of flour for biscuits (Huntley and Palmer in Reading, Serpells in Tilehurst) and pie pastry (Harris in Calne). The mill was only a short distance across Mill Street from the Lower Yard of the Tramway. Previously in this vicinity had been a wharf of a branch of the Wilts and Berks Canal. When the Tramway built the Lower Yard in 1905 there was a proposal to extend a siding across Mill Street into the mill. However, this was not pursued and flour was regularly carried the short distance to the Tramway’s yard by horse and cart (later motor lorries). For full details see Nicholas de Courtais: The Wantage Tramway. Wild Swan, 2017, ISBN 978-1-912038-71-8, pp. 51-53, 80, photograph on pp. 56-57, and plan on p. 94.